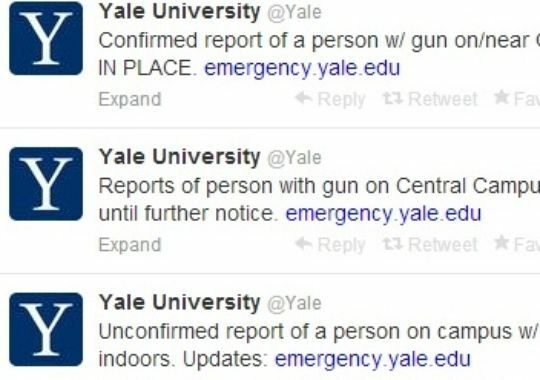 An unknown caller contacted emergency services from a payphone at about 9:30 AM, New Haven time, and told the dispatcher that his roommate was on his way to Yale University to shoot people. This call led to the university being shut down, local schools being put on lock down and all safety precautions being taken to protect the remaining students on campus (it is Thanksgiving break at Yale). This post could begin some sort of rant on a need for gun control. In reality, however, the caller was probably some sort of prankster. This post could begin some sort of argument on being able to see people who are making phone calls–wait I think that the government can already do that. But in reality I am writing this to say thank goodness the police took that call seriously. And thank goodness that it probably was a prank. I know that the United States has become a country with a lot more fears in recent years, but sometimes those fears are founded in something real–taking threats and warnings seriously does save lives. See the Titanic for an example when warnings aren’t taken seriously. I hope that these types of calls don’t become normal. I wish that school shootings weren’t something that the United States is internationally known for. But I just want to say thank goodness for the New Haven police and the Yale campus police for taking the safety of its students and community in the highest regards.